The Aspen Romania Energy Policy Program aims to provide an influential debate and reflection platform for regional business sector and political decision-makers in the energy sector in the Black Sea – Caspian region; and to create a trans-regional (linking the Caspian, Adriatic and Black Seas) strategy and policy review platform in the energy field (for anchoring the Western gate of the New Silk Road). This entire effort is designed to dovetail with EU energy strategy as well as regional and global developments regarding energy markets, security and financing in the field. Bucharest Forum Energy, organized by the Aspen Institute Romania and its partners, integrates the public-private logic of Romania Gateway. 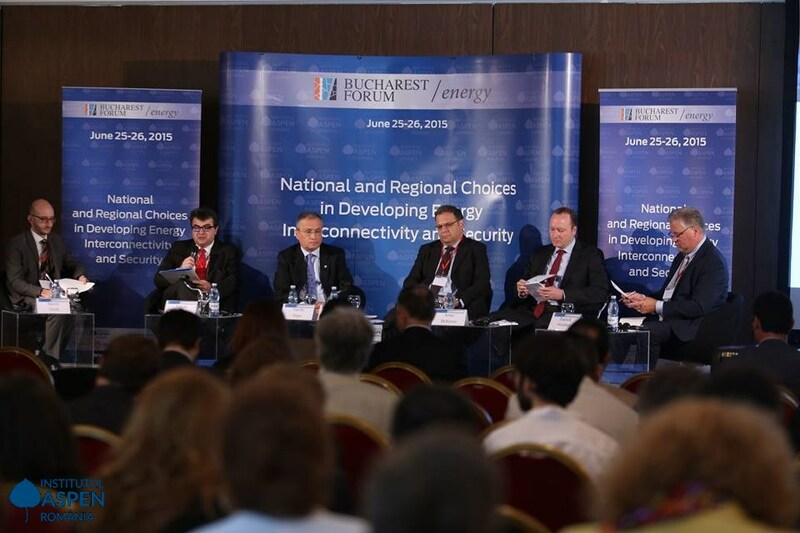 Part of the Bucharest Forum series, the event offers an annual, high level convening platform for private and public stakeholders in the Energy Sector in the Black Sea Region. Topics for the 2007-2015 period included: trans-regional interconnections; energy infrastructure investments; the future of energy sources exploration and production; EU-US trade and investment cooperation at the Black Sea and Caspian Sea; future of energy sources exploration and production; trade, investment and cooperation at the Black Sea; the role of the new classics in the energy mix of Romania and the region; green economy and energy efficiency; management of the resources mix, local market trends and expectations in terms of the legal and regulatory framework for energy; corporate and public investments in the energy sector; scenarios for the right energy mix for Romania. The guidelines issued by the European Commission on the future of the European Energy Union have generated a reflection process amongst the business, industry sector and public administration in Romania in regards to the National Energy Strategy. This process mainly targets the directions that Romania should pursue in terms of market diversification, strategic alliances and energy governance. All these impact the positioning of institutional actors, businesses and potential investors on the domestic market. At the same time, the national Energy Strategy should aim to draw up a set of major directions to be pursued while considering current budget constraints and the possibility of implementing viable business-oriented solutions for the domestic energy market. Both institutional and corporate governance need to be key components of Romania’s National Energy Strategy. The national Energy Strategy would also help investors orient better on the internal market in terms of legislative and regulatory framework and business opportunities. 12:15 – 13:45 Towards a Genuine Energy Union: What Future for the European Energy Security Strategy? A complete Energy Union would foster unimpeded flow of investments to Europe and considerable savings, with estimates around € 40 billion by 2030. Energy security, governance and sustainability issues are at the top of the European and global agenda. An integrated European energy market would also contribute significantly to Europe’s energy security, by mitigating risks of supply disruptions such as those faced by some of the member states. Completing the Energy Union project does not require only political will and proper policy instruments to liberalize domestic energy markets across the EU but also the financial and technological resources needed to set up the infrastructure connecting energy providers with the rest of the continent. In order to achieve this, governments, private investors and the industry need to strike the balance between energy security, affordable pricing and environmental safety and sustainability. These factors are core elements of a European Energy Security Strategy. At the same time, falling oil prices impact negatively the security of EU energy supplies, since most of the European domestic oil and gas production is offshore, mature and increasingly expensive. On the other hand, lower fossil fuel prices are likely to undermine further investments in European offshore production, especially in medium and long term, while dropping gas prices would facilitate Russia’s Gazprom regaining market share against LNG and alternative energy sources. A functional common energy market requires a set of conditions: first, an increased interconnectivity among EU member states, secondly, the existence of a single energy regulatory body, and thirdly, a unique system across the EU to define and protect vulnerable consumers. Fulfillment of the first condition involves increased competitiveness of the national energy systems and grids, as well as regards trans-regional grids. This requires considerable financing and the diversification of funding instruments to support this objective. The reflection upon the National Energy Strategy creates renewed momentum for institutional actors and companies alike to reconsider their approaches as regards competitiveness of the domestic market. Energy producing companies have repeatedly highlighted the need for a competitive environment, one that can stimulate long-term contracts and predictability of the markets. A competitive environment would also require achieving a reasonable energy mix, from the perspective of cost sharing. External markets remain difficult to access for energy producers, including for Romanian ones, due to gaps in the legislation and regulatory frameworks. Yet, examples such as Hidroelectrica’s expansion on the Serbian market and especially the internal reform processes which led such a large company back into profitability stand proof of the success of the restructuring undertaken. Since increased competitiveness on the national energy market demands significant funding, finding alternative financing has become a priority for all actors on the market. Listings could be an alternative to finance large national projects such as Tarnița or nuclear reactors 3 and 4 at Cernavodă power plant or in finding solutions to get companies such as Hidroelectrica out of insolvency and consolidate their position on the market. Also, this year, Hidroelectrica stands chances to go solvent again, become one of the most profitable companies in Romania and expand to neighboring countries, following the expansion to Serbia. This would allow Romania to connect to the wider Central European energy market. The national electricity market is currently undergoing a major reconfiguration; in 2014, Electrica was the largest listing on the Romanian capital stock exchange and is currently undergoing an internal reform and restructuring process while Enel is repositioning strategically on the domestic market. Victor Grigorescu, Member of the Board of Directors, Electrica S.A.
Across the EU solutions are being sought, to allow a large-scale introduction of liquefied gas in the energy systems. In Romania, the port of Constanta will have a liquefied gas terminal in three years’ time. Gas will be transported from one corner of the continent to the other through a system of terminals spread across the Danube. Gas will be used as fuel for ships, which will result in a drop of almost 30% in carbon emissions. The set-up of more LNG facilities would greatly benefit the energy security and climate objectives. What measures should be taken to help reach forward-looking climate policies? First, an Emissions Performance Standard would contribute to limiting the amount of carbon that power stations and industrial plants are allowed to produce. Furthermore, emissions trading in Europe has not delivered a predictable carbon price, needed to guide investments into low-carbon energy. The current carbon price is at the same time far too low to have a major impact on investment decisions. The dramatic fall in energy commodity prices, especially of oil prices, means that a number of fossil fuel assets and fossil fuel reserves are becoming highly unprofitable. In regards to changes brought about by technology, these include benefits in terms of energy efficiency and technology drivers such as solar and battery storage that increase supply and reduce demand from fossil fuels. On the other hand, in the transport system, electric cars are expected to bring about changes in how electricity and gasoline can be combined. By 2020 all EU member states have to implement smart metering for 80% of all energy consumers, should cost – benefit analyses have positive conclusions. In Romania, Electrica will initially implement a smart metering system for a distribution area covering 3,5 mil consumers. This system is estimated to encourage energy efficiency and responsible consumption. Similar instruments could be set up for smart light systems. At the same time, there are still almost 100 municipalities in Romania lacking access to electric power, which constitutes an opportunity for the market to expand. At a regional level, investing and expanding smart grids requires major costs for energy companies. This involves finding or designing new financing instruments. Oil and gas resources from the Caspian region have been at the forefront of the energy policy agenda even more in light of the recent geopolitical developments. While the better part of the debate has taken place over which route these resources should take to reach Europe, the past decade has seen the issue of resource allocation shift entirely with the entry of the Chinese energy consumer. While both the EU and China are energy hungry economies, this competition is proving to be a significant factor in the energy policy agenda changes on both sides of the Caspian Sea. At the same time, it is an important leveraging factor for both the Caspian region, as it helps diversifying its consumer markets, as well as Europe and China, as it helps diversifying their sources. The drop in oil price has turned to a significant degree the debate from policy to economics. Gazprom’s recent threats on security of gas supply to Europe has put pressure on EU actors in regards to anti-trust proceedings. It can be expected that innovation in efficiency and technology will change the energy mix and prices in the energy economy, potentially resulting in further stranding of high carbon and high cost fossil fuels. On the other hand, liquefied natural gas has a great potential to become an important commodity on the fuels market. While most LNG installations are situated in North America, Asia and Northern Europe, around 33 companies from 12 European countries will contribute to the LNG transport Masterplan across the Danube. Another important point for this project is the current 1.000 cm terminal, presently under construction at Ruse, Bulgaria. The LNG terminal in Istanbul should be finalized in 2018 and is designed for a 5000 cm capacity. Current Commission plans for the region include work on the Southern Gas corridor to bring gas from Central Asia to Europe. Central and Eastern European countries are encouraged to follow the example of Nordic states and increase their LNG facilities. Faced with rapidly declining domestic energy production and potential rising competitiveness of external suppliers, measures that can be taken are related to tax and arrangements that can limit damage to production from lower oil prices. The rise of emerging markets has transformed the global economy and reshaped trends in energy – dependent industries across the world. Since 90% of net energy demand rise is expected to originate in emerging economies, key changes which impact the investment and financing opportunities on these markets provide significant insight for the future of their economic development models. Not only industrial output shapes growth prospects for these markets, but also the profile of the main consumer categories and the resilience of their energy systems. Energy reform needs to be adapted to the characteristics of the business and governance environment in which it takes place.